After partition in 1947, Hindu Sindhis spilled over to Indian side and scattered all over India. Where Sindhis were in sizable numbers, they established Sindhi schools where Sindhi was taught in Arabic and Devnagiri scripts. But over the years these pockets of Sindhi community started shrinking. Sindhis scattered more into areas where Sindhi schools could not be sustained. More and more children were leaning towards English, and Sindhi as a language was getting overwhelmed by local languages and losing its hold over its community. Many suggestions floated around but no one had a definite idea as to how the language could be preserved among Sindhi Hindus in India and abroad. Sindhis who had migrated outside India had greater love for the language and made some attempts to Romanize Sindhi for the sake of posterity. But the attempts were half baked. No one seriously took up this challenge till this topic came up for discussion at the Alliance of Sindhi Associations of Americas Inc. (ASAA) Sindhi Sammelan in LA in July 2009. A Roman Sindhi committee headed by Mr. Arjan Daswani of Singapore was constituted. 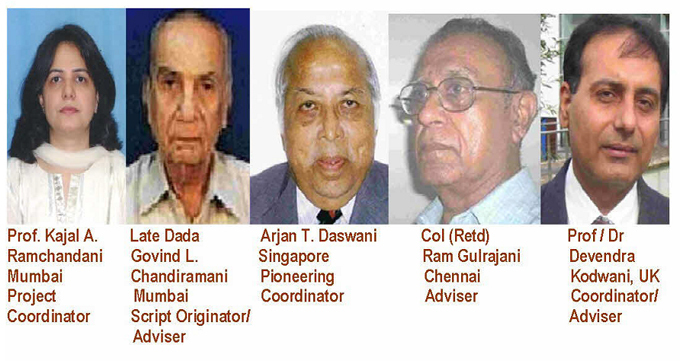 He in turn roped in Mr. Govind L Chandiramani of Mumbai (who had made some tangible attempts at Romanizing Sindhi script and was maintaining a web site), Col. (Retd) Ram Gulrajani of Chennai and Dr. Devendra Kodwani of UK. These four formed a core group and worked on it for a year on standardizing Romanized Sindhi script for Global Sindhi use. Capping this pioneering work was done at Ahmedabad through a Conference of Sindhi scholars on 29-30 March 2010 with minor modifications. (Please refer www.RomanizedSindhi.org for the importance of preserving a language, particularly Sindhi, which has a rich cultural heritage connected with it. Having succeeded in getting approval of Sindhi scholars, the team started the work of making charts, elementary and basic lessons, in consultation with school teachers and institutions who were still engaged in teaching Sindhi in Arabic or Devnagiri scripts. I was privileged to join the team and took over the task of coordinating all basic work in India. I was co-opted as full member of the pioneering team. Alot of work in this regard was also done by some people in Sindh Pakistan, who undertook as a service to the Sindhi language. The enthusiasm and participation especially of Ms Rafia Sarwar Shaikh (Sindh Pakistan) was amazing. The team also accomplished the onerous task of making audio files (an essential ingredient for learning any language in the absence of a qualified teacher). In the meantime, the team started its Herculean task on Romanizing Sindhi dictionary. For this task, it was felt that the existing team of pioneers needed more young blood coupled with a responsibility of an established institute. Accordingly ASAA decided to present and handover the complete project of Romanizing Sindhi to Indian Institute of Sindhology (IIS) at Adipur in Gujarat (India). This was done at the Alliance's Ahmedabad Sindhi Sammelan in December 2011. IIS agreed and took over the ownership and management of this project with effect from 01 January 2012 with an understanding that the existing “pioneering (core) Committee” will continue to guide the project as long as they can. I was appointed the co-coordinator between the ASAA/ Roman Sindhi Pioneering (core) Committee and IIS. ASAA appointed me as its Director (Romanizing Sindhi). This huge task took its toll on Mr. Govind L. Chandiramani’s health who left us for his heavenly abode on 26 December 2011.